Routley joins the London-based strategic marketing consultancy as an account director from AMICULUM Digital, where he was commercial lead, having moved to that company from Havas Lynx. In his new role he will be responsible for leading the account teams and integrating the creative, strategic and customer experience services. As a senior consultant at Blue Latitude she will direct the translation of brand strategy into executional outputs, developing brand strategic positioning and messaging, multichannel capability and cross-functional integration. Finally, Zygadlewicz comes to Blue Latitude's creative team as art director having previously worked at McCann Healthcare in Paris and HAVAS Life in London. 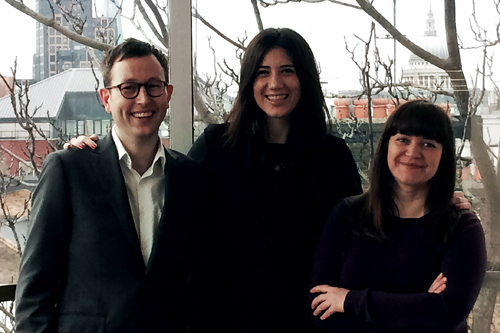 Martin Brass, Blue Latitude's co-founder and managing director, said: “We're all very excited to have Ben, Natalie and Kasia join Blue Latitude during this exciting period of growth." Meanwhile, Elisa del Galdo has been appointed to Blue Latitude's board of directors. She joined the agency in August 2013 with 20 years' experience in human factors, usability and user experience. For more information on Blue Latitude or to schedule an interview with Ben Routley, Natalie Seebeck, Kasia Zygadlewicz or Elisa Del Galdo, please contact Selina Wragg, Digital Content Manager at Blue Latitude via email selina.wragg@bluelatitude.net or call +44 (0) 203 328 1858. Blue Latitude is a strategic marketing agency, focusing on creating exceptional customer experiences in healthcare to positively influence lives. Our core capabilities are Strategy, Customer Experience and Creative Services. We solve complex problems, delivering value to our client’s customers and wider business.